Out of the box the thermometer has a good feel to it. It’s got some weight, but I have to admit that the plastic casing makes me weary of it surviving a drop. A Wii style wrist band would have been a good addition for those with slippery finger syndrome. Overall, the thermometer performs well and provides fast and accurate readings. Keep in mind that this little guy take surface temperature readings as opposed to air temperature readings. Because of this, I would most recommend this tool for somebody that does more grilling than smoking. The Maverick Laser Surface Thermometer works great on a pizza stone, and is definitely the way to go if you’re looking to fine tune your temperature control for burgers and steaks. This little guy helped me located the hot spots on my Weber Kettle within seconds of opening the lid. At the time of writing this article, I’ve only had the thermometer for a couple of weeks. So at this point I can’t speak to it’s durability over repeated us, but after multiple cooking sessions it’s still working exactly the same as it was when I took it out of the package. All in all, this is nice piece of equipment that I feel comfortable recommending to a griller that’s looking to establish better control over their surface temperatures. So, does this sound like a piece of equipment that you need to have? If so, just leave us a comment below letting us know your thoughts on the laser thermometer. We’ll randomly select one lucky person to receive a free Maverick Laser Surface Thermometer. UPDATE: Contest is now closed. If it’s accurate and it doesn’t disturb the meat, then I say it’s a piece of equipment to own! Sounds like a cool tool! I need to find out where to get one of those. Thanks for the review. This would make a great gift for my wife…she’s a grilling maniac! Sounds like it would be great for the smoker to keep the temps in control. The two biggest things you need to know when barbecuing (as opposed to grilling) are the temperature inside the closed grill, which you don’t want to open to check since you lose about 50 degrees with even a quick peek, and the temperature inside the meat so you can know when it’s done. It doesn’t sound like this thermometer does either of that. Do you use it just to check how how the grill is at the surface where you, say, grill burgers? I like the pizza stone idea and as well this would be perfect for a grill top griddle. I use both over wood fire on occasion and have run into hot spot issues. This would be the next best tool to add to the collection. Because the older woman across from me at work here decides to point her infrared thermometer to see the temperature of my cubicle, I would like one to point back at her and at my grill of course. This would be awesome for when I’m trying to separate temperatures on my grill. I’ve wanted one of these ever since Alton Brown played with one on his Good Eats show a few years back. I could have used one last weekend when the dome temp of my Egg was 400f but because of opening and closing the lid for 2 minute grill times, I wasn’t sure of the surface temp at the grate but it was obviously way hotter. Sounds like I’d have to try it out to give my two cents. Sounds like a neat gadget, I’d love to give it a try! Though I don’t know that it’s a necessary item to have – most grills come with a temperature gauge you can read without opening the grill, and as far as the temperature of the meat I am more concerned with the INSIDE temperature than the surface temperature. Yep, I can certainly see a few uses for this! My gas grill is a little uneven, and being able to identify hot/cold spots without guessing would be great. I can also think of a few non-cooking uses as well. Sounds like a good idea for when the kids are are sick & I don’t want to get too close!! I have always been interested in one of these in past. I have seen Alton Brown use one for years. I think this would be great for a Pizza stone or even cooking Burgers APL (Adam Perry Lang) Style on a griddle on top of your grill. Wow where can we get one? I compete in the NEBS grilling comp and have made a home made pizza oven out of a 30 gal drum. I know it gets up around 800 degrees but I don’t have my own infrared.It would be great for the grilling and oven! I have a similar unit, but it doesn’t have the temperature range. With that wide of a range, if the unit is accurate that would be a huge selling point for me. Now all we need is a laser that can measure the temp on the INSIDE of the meat! 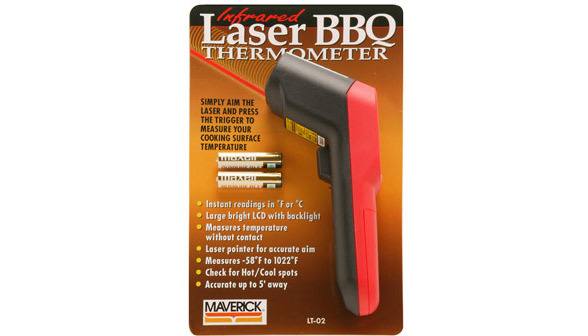 having a laser thermometer would be a great tool to have as part of my BBQ arsenal, especially at BBQ comps when temps have to be right on. Thia would make grilling temps a lot easier which is all about time and temp anyway. I would love it for my Beer Can Chicken so I don’t have to keep poking holes. I’ll take one with a side of ribs. Can’t wait til Friday!!!!! My son could use one of these thermometers grilling for each time we asked for a medium rare steak it arrives rare. As long as there are barbecue enthusiasts in the world, the world will continue to create new barbecue gadgets. This is a great tool for the childrens..
A really cool tool. Then again I wonder how many will actually use it. I am interested in knowing more about the Laser infrared surface thermometer as I have several other types and am looking for one that is more accurate and useful for grilling and smoking. I have a friend that has one, its a must have for any BBQ!! This is the best thermometer I have ever heard of. I have been looking for a thermometer for in house & BBQing for a very long time & nothing sutited me. I NEED one of these!!! Maverick Laser Infrared Surface Thermometer seems to be handy if I get a chance to test it, it will be better. But I have tested Tru-Infrared Patio Bistro grill released by the company Char-Broil. So without getting my hands on Maverick I can’t say anything which is best among them. I feel that this would be an absolute necessity for my barbecuing, frying, and grilling. It would be a definite asset to my many applications. I would be more than happy to give feedback on it’s versitility.